I have to admit that I didn’t know a single thing about the Ghost In The Shell universe before this week, but being the good film student that I like to think I am, I did my homework and watched the original 1995 animated feature before going to see this Hollywood remake. Would the controversial 2017 version of the story be able to match the immersive aesthetic?I’ll take the beginning of this review to address said controversy. Sadly, and inevitably, the filmmakers decided to cast Scarlett Johansson and other Caucasian actors in lead roles, leading to accusations of whitewashing from those who understandably wanted Asian actors to portray the iconic Japanese characters. If you’re looking for a defence of this decision, you won’t find it here. Though this telling of the Ghost In The Shell story does insert narrative details to account for the presence of a white lead actress in a sea of non-speaking Asian extras, it doesn’t make the reality of the whitewashing any less offensive. I’ll be honest and admit that this controversy alone was enough to turn me against the picture, but in order to try and discuss other aspects, I’ll refrain from bringing it up after every sentence. Let this be my formal paragraph of disapproval. Let’s start from the beginning then, shall we? Ghost In The Shell tells the story of a futuristic Asian inspired society where the lines between natural human life and cyborg technology are more blurred than ever and cyber terrorism and ‘brain hacking’ is rampant. Mira Killian, also known as Major, (Scarlett Johansson) is a highly advanced cybernetic being with a human brain who works for the Department of Defence in their counter-terrorism efforts. Up to this point a loyal worker for the Section 9 bureau, Major’s once straight forward directives become clouded when she starts to experience ‘glitches’ and begins to learn more about her forgotten past. That brief synopsis is just about all my comprehension can provide for you, like I said, this kind of science-fiction isn’t something for which I hold a strong understanding. 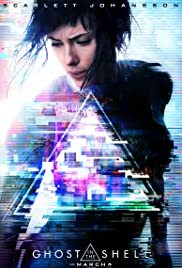 My main takeaway from Ghost In The Shell is that it’s visually striking but ultimately hollow, and I would try to make more of the pun potential in that sentence if I weren’t so unenthused by the entire affair.On a purely aesthetic level, the film does a fun if not slightly over the top job of portraying a world where technology has reached unprecedented levels. The cityscape is a sprawling mass of skyscrapers boasting enormous 3D holographic hangings, and whilst the sight of such technology impresses on first look, unlike the textured, multi-layered world building of the 1995 original, this 2017 incarnation of the setting doesn’t add much character to the film other than being cool and shiny. There was almost a steam punk feel to the Japanese animation that beautifully mixed with the high tech narrative, but this version seems almost sterile and lifeless despite its busy crowdedness. As for audience engagement, perhaps those more experienced in the themes of cybernetics, coding and hacking might find more enjoyment than I did.The more ‘human’ moments of the plot involving Major, her journey to discover her backstory and her interactions with her designer Dr. Ouelet (Juliette Binoche) were the moments that I found most rewarding, whilst the majority of the scientific exposition and set pieces involving diving in to people’s mainframes and such left me completely cold. I’m completely willing to accept that this type of story was never going to be something that made a fan out of me, but whilst the 1995 original I had watched a day earlier kept me captivated yet confused, this sterilised remake did absolutely nothing for me beyond letting me spend some brief time with one of my favourite actresses, Juliette Binoche. Despite my admitted lack of understanding, I can’t help but shake the feeling that even for those who love this kind of thing, the 2017 Ghost In The Shell simply isn’t a good example of it.Aside from the questions Scarlett Johansson should be asking herself about accepting a role that simply shouldn’t have been played by a white woman, there is no denying that she has a knack for portraying these kinds of oddly detached characters. As she has done in previous films like Lucy and Under The Skin, Johansson seems to excel in playing characters that operate in peculiar ways and under extreme circumstances. Her version of Major is strong, adept, commanding yet always possessing that defining quality of ‘otherness’ that the character needs to fit in to the narrative. Supporting roles are given by the likes of Juliette Binoche, Michael Pitt, Pilou Asbæk, and Peter Ferdinando, all of whom are fine but all of whom are unavoidably white, and therefore should probably have known better. There is some room for half prominent Asian cast members including Takeshi Kitano as Section 9 Chief Director and Chin Han as Section 9 colleague Togusa, but honestly this screams of tokenism and feels a lot like a case of too little too late in the grand scheme of things.